You can’t have a birthday party without a birthday cake. It doesn't really matter if it’s a surprise party for an adult, or a meticulously planned children’s party – birthdays and cakes go together. 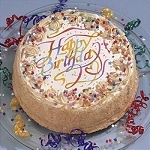 Just remember any of your childhood birthdays – there was always a cake involved, right, and you can almost always remember the moment you got to see – and taste – your birthday cake. 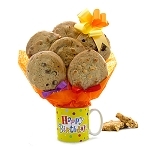 We offer you two different solutions for birthdays – birthday cakes, and birthday coffee mug cookie bouquets. They are the perfect birthday gifts, and regardless of which one you choose, the person receiving the gift will be in for a very sweet and lovely treat. GiftProse is the online gift shop that strives to provide you with the perfect gifts for you loved ones. Whatever the occasion may be, you’re bound to find a perfect gift in our online shop. Our products are easy to order, as well - you can try ordering right now.